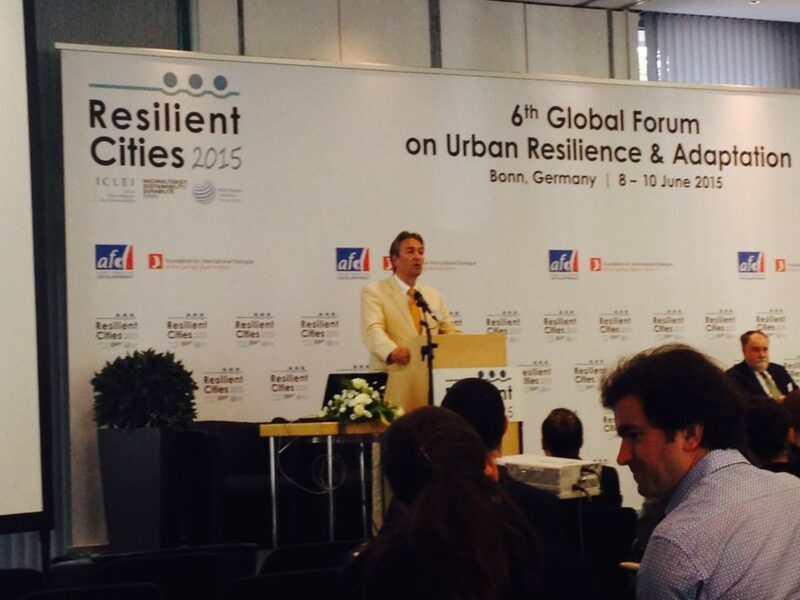 Resilient Cities 2015 opened with a local and global focus – or, as Mayor Jürgen Nimptsch of Bonn put it, a “glocal” focus. This is much more than a panel dialogue or position paper. This is about saving lives. Nimptsch’s comment was reinforced by Datuk Seri Ir. Hj. Idris bin Hj. Haron – the Chief Minister of Melaka State Government, Malaysia, where floods are currently taking place. Mayor Jürgen Nimptsch of Bonn speaks at the Opening Plenary. Melaka is embracing the concept of green cities, and is working extensively to build resilience. In the past five years, more than 194 flood mitigation projects have been implemented in the city, shielding nearly one million people from floods. Similarly, Rajkot is currently facing severe water shortages as a consequence of a heat wave in India, with more than 2,000 deaths reported across the country as temperatures have reached 48 degrees Celsius. Former ICLEI President David Cadman pointed out that sharing these kinds of on-the-ground examples helps to overcome climate skepticism, demonstrating that the impacts of climate change are being felt and that responses are required. In an assessment of key outcomes and developments in Urban Resilience through 2014 and 2015, Jerry Velasquez (Chief of Advocacy and Outreach, United Nations Office for Disaster Risk Reduction) discussed the outcomes of the World Conference on Disaster Risk Reduction in Sendai, Japan. The framework that was adopted at this conference included seven ambitious global targets, but the most ambitious, Velasquez said, was that of reducing economic loss. This was greatest in rich countries and all previous efforts to reduce it had failed. The best way of doing this is to increase the number of countries with national and local plans for increasing disaster preparedness. The Sendai outcome is aiming to do this in the next five years, to enable cities to meet the rest of their targets. Velasquez also highlighted the need to “lower the bar” for cities. Cities are hearing about the need for action on disaster risk management and adaptation but are unsure how to implement the plans. For example, cities are unsure about the difference between disaster risk management and adaptation, which have different funding streams. There is a need for integration and a comprehensive framework to make implementation easier and clearer for cities. One contribution in this respect comes from the World Council on City Data, which has developed the ISO 37120 – the first standard on global city indicators. This ISO uses over 100 key data points, allowing cities to analyze and compare their performance. The WCCD is now looking to draw on this ISO to create an ISO specifically for resilient cities.